For our assisted living, hospitality, and church chairs, we offer an innovative option called cold cured foam for seat cushions. Cold cured foam contains strategically placed air pockets throughout the cushion to provide outstanding long-term comfort and performance. This type of cushion is typically available on only fixed theatre seats and car seats. Now, we bring them to your guests. What is cold cured foam, and why do we use it on our chairs? 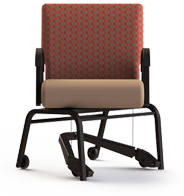 Here are 5 advantages to using molded cold cured foam cushions: Read More What is cold cured foam, and why do we use it on our chairs? The Vista line of banquet chairs breathes prima moderno. Aesthetically pleasing, they’re crafted with elegance to provide a luxurious setting for your guests. With our VistaPlus+ Series, we take that elegance and luxuriousness to a new level.